An ancient walled city with a strong wind that blows 24 hours. 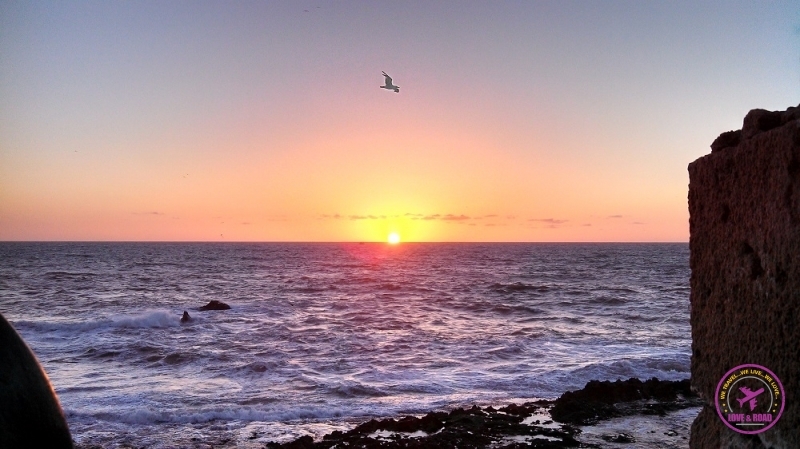 Essaouira, Morocco, is a stunning beach, a kitesurf paradise and Game of Thrones location. I’m looking at my notebook for almost 30 minutes struggling to find the correct words to write about Essaouira, Morocco. I loved that city, the relaxing atmosphere, the nature and the history, but I can’t find a proper way to describe it. Essaouira, Morocco was beyond my expectation! After three hours on a bus (with a Moroccan girl that never stopped talking on her mobile, annoying! ), we arrived in Essaouira, Morocco. We dropped the bags at the hostel and started our expedition around the city. Suddenly we were in front of the big wall, the cannons and one of the most beautiful sunset I have ever seen! Probably you have already seen this place. The wall, the cannons and the sea from Essaouira, Morocco, got really famous as Game of Thrones filming location. So not a doubt that Essaouria is a stunning place. The scenes of Game of Thrones were mostly shoot at the seaside wall, around the fortified entrance of the port and at the old alleys inside the Medina. Back in 1500 the city was called Mogador, a Portugal’s port city used as a base to reach South America. Because of that, Essaouira has a mix of Arabic – European architecture and groove. It’s hard to explain this town because it’s a Moroccan Muslim city, but the feeling of being there is so laid-back, different from other towns we visited in the country. Men and women dressed like Muslims share the streets and the beaches with hippies, hipsters and kitesurfers. Don’t be surprised if someone offers you hashish to you in the middle of the street. Although alcohol drinks are very expensive and you can find just in a few places. What a mix! What a great mix!! And of course, for us the best part of Essaouira was the beach! The wind blows 24h – 7 days a week, non stop. The salty wet breeze makes your eyes watery, but we never got tired of sitting there to watch the kitesurfers. Amazing waves, a paradise for pro and an opportunity for beginners. 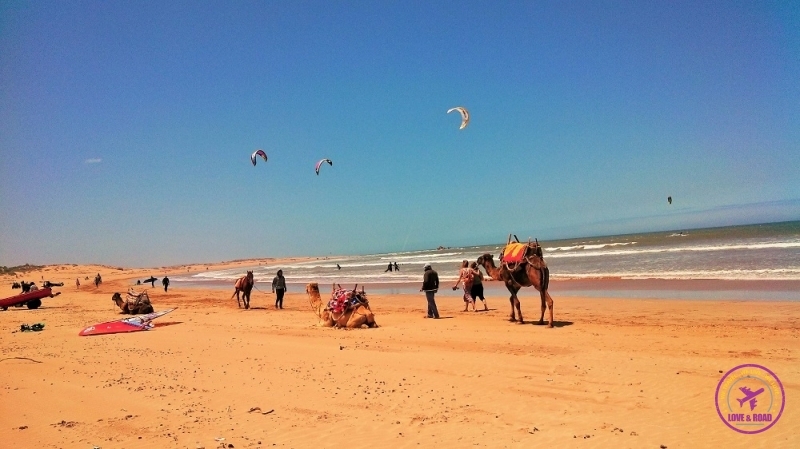 Essaouira is plenty of surf, kitesurf and windsurf schools. For all tastes, levels and pockets. You can even book surf lessons and a camel ride after the waves. Rob, my surfer man didn’t enjoy the sea and the waves. We were there in May for three days and the water was freezing. Too cold and the waves weren’t that good. The beach near the town has some restaurants, place for bikers and for runners. Sand and Sea as far as you can see. One morning we decided to go for a run, after seven kilometers we still couldn’t see the end of the beach, it seems that it goes forever. Essaouira was a great present after 10 days in the wacky Marrakech. Simple accommodation (we stayed at Dar El Pacha, Dar means a Moroccan house bigger than a Riad), good food with fair price, and relaxed travellers. This place is special! Something about the energy, the ocean winds and the golden sunsets that enchanted millions of visitors, including Jimi Hendrix. The famous musician visited the city in the summer of 1969 and since then some of Mr. Hendrix´s tales are still alive in Essaouira streets. Only visiting Essaouira, Morocco to understand it! Have you already visit a city that was beyond expectations? Did you know about Essaouira, Morocco before? Ever since Game of Thrones this City has been on our list to visit! We hear the Archaeological Museum is supposed to be fascinating. Essaouira is a must visited city, especially if you enjoy nature and relaxed atmosphere. I was so excited with the outdoors activities that the weekend wasn’t enough to visit all the town´s attraction, so we didn’t visit the museum. 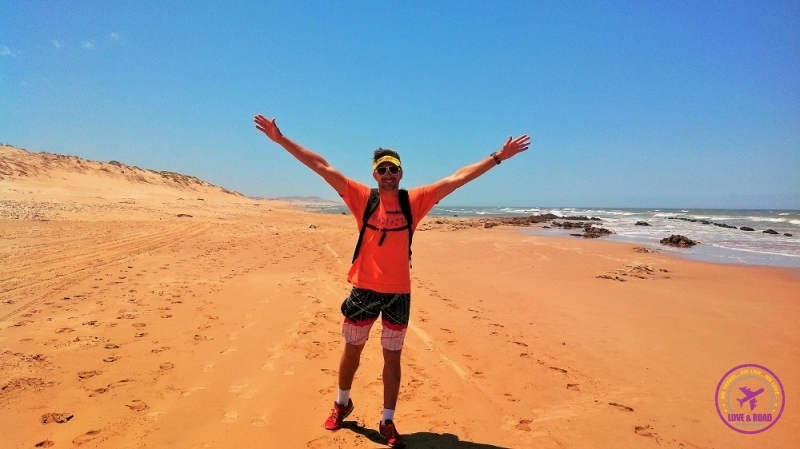 in fact, I loved my whole trip in Marocco and will come back to see some more! Did you also see goats in trees?? Such a strange phenomenon! Great!! I wanna return to get the surfing season! Those goats are crazy!!!! We saw them during our bus journey. Sounds like a great place. And I love those markets where I can freely roam and window shop without anyone bugging me at my back to buy something from their stores. Would add this to my future destination. Essaouira has a really laid-back atmosphere. You can walk around and no one will bother you. What a great article! I was in Essaouira myself and while reading the article i was in Essaouira again for some minutes. Really glad that you like it! Essaouira is a magical place! We travel here next Thurs and this article is very interesting and great read. I was a bit worried that I would not have much to do here but after reading this it sounds like I will be busy here which is great. Glad you found the article and liked it! We had a great time in Essaouira, such a relax city. Good to have a break from the busy Marrakech! Hope you have an amazing trip!